Poppycock release new single called 'Iggy Pop' and it's fab! | Louder Than War Poppycock release new single called 'Iggy Pop' and it's fab! Poppycock release new single called ‘Iggy Pop’ and it’s fab! Poppycock were formed by legendary Manchester musician and community activist Una Baines who was a founder member of the seminal post-punk groups The Fall and Blue Orchids. Released today is this classic piece of minimalist ‘Girls in the Garage’ rock’n’roll celebrating the freedom which Iggy Pop personifies. It’s like a feminist ‘I Wanna Be Like You-hoo-hoo’ in the style of Jonathan Richmans Pablo Piccasso says Ged Babey. It’s just a classic piece of primitive, lo-fi, low-profile, garage rock’n’roll made by glorious amateurs who are old enough to know better…. 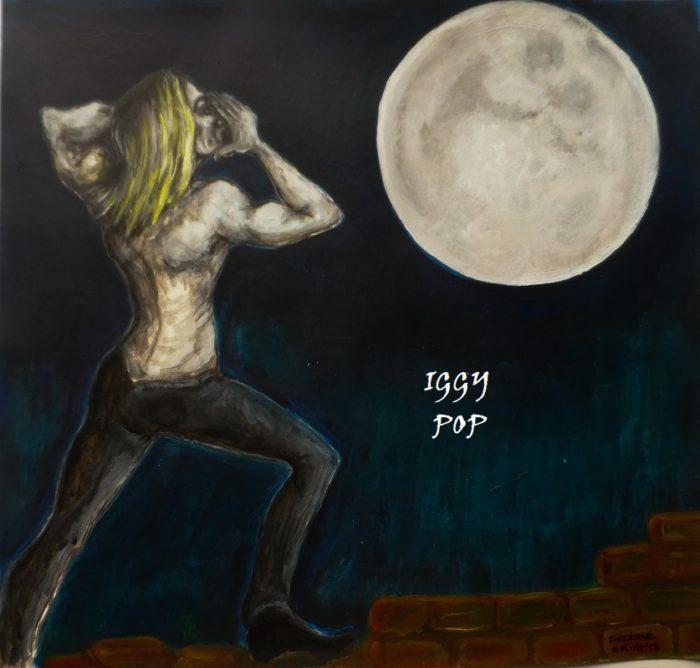 and its a celebration of the truly legendary Iggy Pop. It’s it the same irrepressible style as Jonathan Richmans’ Pablo Picasso, ( or Vic Godard’s Johnny Thunders or The Rockingbirds Jonathan, Jonathan … songs which capture the essence of their subject. I feel like I grew up with Iggy Pop, listening to his music over the years. He’s such a free spirit, and seems very in tune with nature and he reflects that. Something we are losing in the Western world – our wildness. The freedom of running through a park wearing just a pair of jeans is considered OK in our society – if you’re a guy. Women on the other hand, well it’s a measure of the freedom men can take for granted and women certainly can’t. I asked if she listened to Iggys radio show on BBC 6Music? – and wouldn’t it be good to hear him play it on the radio…? I have listened to his show, which I really enjoy. And wouldn’t it just be the bees knees for him to play it. Still got my pocket full of dreams. The artwork is by Suzanne Smith, sister of Mark E, who was responsible for many of the covers for Fall releases. The song has proved to be a live favourite in Poppycocks set and it’s great to hear the return of Una’s trademark organ sound. The single was produced by Una Baines and Manos Sarantidis. It was recorded in July 2018 at the fabulous community resource Seed Studios in Old Trafford. A second single, Magic Mothers, will be released later in the year, with an album to follow in 2019. Buy the Download from here for a mere 50 shiny new pence and let 6-Music know if you wanna hear it on the radio. Now I wanna hear Iggy croon on a song called Una!